Bruce Banner is on the run in Brazil where he is working at a soft drink bottling factory. He is communicating with a scientist in the US in an effort to find a means of eliminating the Hulk inside himself, while also trying to learn techniques that allow him to control his pulse and not transform. When drops of Bruce’s blood from a cut end up in one of the drink bottles, this draws the attention of General Thunderbolt Ross and the military who come hunting him. The Hulk emerges during the pursuit but Banner escapes and returns to the US where he meets up with Betsy Ross again. The military continue hunting him every step of the way. Emil Blonsky, one of the lead soldiers in the hunt, becomes fascinated with the Hulk and accepts General Ross’s offer to be injected with an experimental serum synthesised from Bruce’s blood. Film adaptations of Marvel Comics superheroes has become big business in the 00s where we have seen the likes of Blade (1998), X-Men (2000), Spider-Man (2002), Daredevil (2003), The Punisher (2004), Elektra (2005), Fantastic Four (2005), Man-Thing (2005), Ghost Rider (2007), Iron Man (2008), Captain America: The First Avenger (2011), Thor (2011), The Avengers (2012), Guardians of the Galaxy (2014), Ant-Man (2015), Deadpool (2016), Doctor Strange (2016), Black Panther (2018), Venom (2018), Captain Marvel (2019) and various sequels to most of these, as well as the tv series’ Agents of S.H.I.E.L.D. (2013– ), Daredevil (2015-8), Agent Carter (2015-6), Jessica Jones (2015– ), Luke Cage (2016-8), The Defenders (2017), Inhumans (2017), Iron Fist (2017-8), The Punisher (2017– ) and Runaways (2017– ). The slate of Marvel adaptations seems to have no end in sight, including planned adaptations of Ant Man, Deathlok the Demolisher, Dr Strange, The Hands of Shang-Chi, Luke Cage, The Silver Surfer and Sub-Mariner. One of the more contentious among the various Marvel film adaptations was Ang Lee’s Hulk (2003). Lee adapted one of Marvel’s most enduring characters The Incredible Hulk, which was originally created in 1962. Lee gave the character a more complex origin story and for some reason made the film in a distracting visual style that looked as though it was being directed in comic-book panels. Hulk was disliked by many, although has a growing number of defenders, including this author. Though Hulk was regarded as a flop, it was not unnoticed by Marvel that it earned some $132 million at the domestic box-office (a sizeable earning, although not enough to recoup a $137 million budget). The idea of a sequel was first floated around 2006, initially proposed as a direct-to-video production that would star David Duchovny. In 2005, Marvel Studios, Marvel Comics’ film production arm, announced that they would be taking a more hands-on involvement with their film properties. 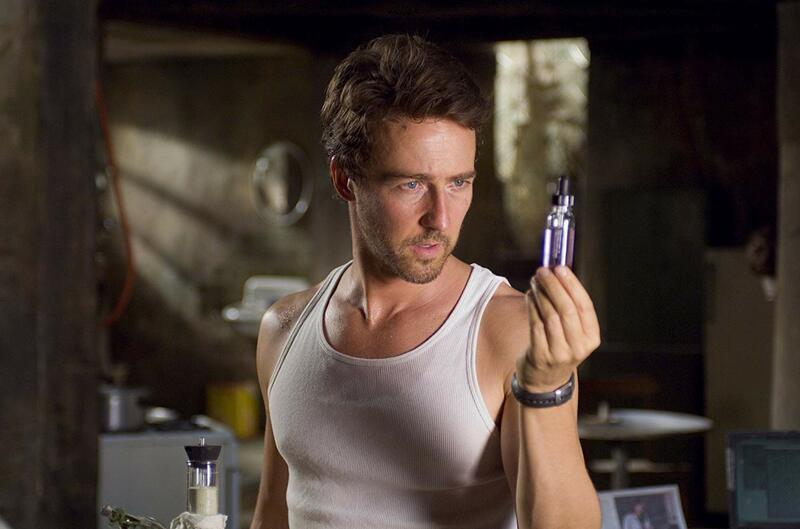 The Incredible Hulk was bumped up from a video to a theatrical release and the central role recast with Edward Norton. The director assigned was the French Louis Leterrier, best known for the preposterously entertaining The Transporter 2 (2005), the subsequent remake of Clash of the Titans (2010), the bank-robbing magicians film Now You See Me (2013) and the spy comedy The Brothers Grimsby (2016). The Incredible Hulk is not quite a sequel. It can easily be seen to be following on from the events of Hulk but appears to have been considered by its creative team more as a franchise reboot. On board is screenwriter Zak Penn, who also wrote the screenplays for other Marvel adaptations such as X2 (2003), Elektra, X-Men: The Last Stand (2006) and The Avengers. Penn and Leterrier made a point of stating how they were rejecting Ang Lee’s version and returning far more to the comic-book. Thus The Incredible Hulk comes with a great deal of fanservice, including all the requisites cameos from Stan Lee (as the man who unwittingly drinks the Hulk blood-infected soft drinks) and Lou Ferrigno, the Hulk from tv’s The Incredible Hulk (1977-81), as the security guard that Edward Norton gets past disguised as a pizza boy. Zak Penn stacks the script with Marvel in-references – the opening credits display documents from both Stark Industries and Nick Fury, Edward Norton’s e-mails are later monitored by S.H.I.E.L.D., and General Ross refers to the experiments to create a super-soldier in World War II (ie Captain America). In what then became an easter egg for fans in all Marvel adapted films, there is a surprise cameo at the end from Robert Downey Jr straight out of Iron Man who, judging by the dialogue, is recruiting for The Avengers. Zak Penn’s script even wittily deals with some of the real-world logic that one always kept asking about The Incredible Hulk – like why Bruce Banner never considered attending an anger management course, and, of course, the question of how his pants always manage to stay on when he turns giant-size in showing Edward Norton shopping for stretch pants throughout. Although The Incredible Hulk generally received better notices than Hulk did, it is a mixed bag. Louis Leterrier has dispensed with Ang Lee’s attempt to make the film look like a series of comic-book panels and claims the emphasis has now been placed on the action element. In truth though, the two big scenes that Leterrier sets up here – with The Hulk and the military battling on the campus and the big climactic street brawl between The Hulk and the transformed Tim Roth – are not a patch on the glorious scenes that Ang Lee created with the Hulk gracefully bounding through the desert, riding on the back of fighter planes and biting the heads off missiles. Try as they might, the visual effects team do no better than ILM did in Hulk in making the transformed Hulk look any less like a big green CGI cartoon character. Certainly, Louis Leterrier gives the Hulk a fine introduction in a scene with it erupting in a factory and only being seen as a shadowy figure as it batters about soldiers, thugs and stainless steel tanks. The problem the film faces is that there is not much you can do with The Incredible Hulk as a character. Creating a sequel is akin to making The Further Adventures of Dr Jekyll and Mr Hyde – the sum of Bruce Banner’s conflicts were dealt with the first time around and all that is left is repeating them over again. The choice in terms of continuing plots for the Incredible Hulk seem either to go the path of the The Incredible Hulk (1977-81) tv series, which dealt with Banner’s travels around the country and how the Hulk emerged at inconvenient times as he became involved in someone’s troubles each week, or with the comic-book, which made the Hulk articulate and created a series of superheroic nemesis for him to combat. However, the film here never does any of these. There is a superheroic nemeses that turns up at the end in the form of Tim Roth’s mutant, which is meant to be the comic-book villain of The Abomination. Oddly, though The Incredible Hulk seems to be a concerted effort by all concerned to dissociate this film from Hulk, the script seems to be just giving us more of the same that we had the first time around – Bruce Banner on the run and pursued by the military as he tries to rid himself of the Hulk, his love for Betsy, the emergence of a mutated monster right at the end – and not much more than that. Edward Norton is an actor who has accrued a host of award nominations and has been slapped with labels like Best Actor of His Generation. For all that (and even though he had a hand in the script, being credited on the film’s poster, although peculiarly not the credits on screen, where he takes the pseudonym of Edward Harrison), Norton never does much with the role. It is fairly much a walk through that any actor could have done and we never see Edward Norton bringing his vaunted acting skill to bear. The idea of casting the perpetually non-acting Liv Tyler as a scientist is one that in conception seems to rank down at the level of credulity gap required to accept Denise Richards as a nuclear scientist in The World is Not Enough (1999). William Hurt at least tries to shake casting as one of the dullest actors in the world as Thunderbolt Ross, although Sam Elliott had much more fun with the same part in Hulk. Both Tim Roth and, in particular, Tim Blake Nelson get into their mutual roles with relish, although they are lumbered with the problem that neither of the parts have been written with any depth. The Incredible Hulk next appeared in The Avengers (2012), Avengers: Age of Ultron (2015), Thor: Ragnarok (2017) and Avengers: Infinity War (2018) where the role was recast with Mark Ruffalo. Ruffalo also made a cameo as Bruce Banner at the end of Iron Man Three (2013).